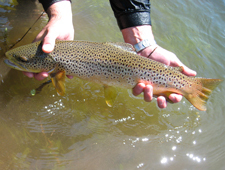 Click here for Current Conditions on the Blackfoot River. The Blackfoot River was made famous back in the early 90’s with the movie, “A River Runs Through It.” The Blackfoot River can best be described as a river that winds through a conifer lined canyon, with crystal clear water. A good bit of the river is strewn with big boulders and cliff walls. The Blackfoot River canyons were formed by the glacial lake floods that occurred at the end of the last ice age. 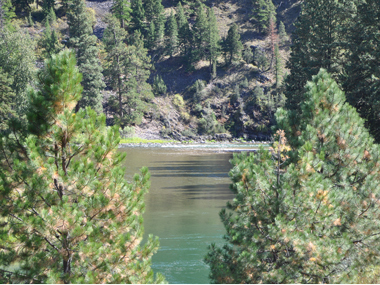 Many consider the Blackfoot River as one of the most scenic rivers in Montana. The Blackfoot River originates 10 miles to the northeast of Lincoln, Montana. Its flows come from snowpack and springs near Rodgers Pass. Its total length is 75 miles at the point where it feeds in to the Clark Fork River east of Missoula. 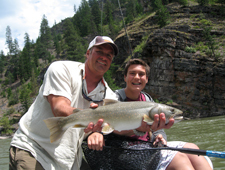 All species of trout, brown rainbow and cutthroat are present along with bull trout which require the most pristine water to survive. 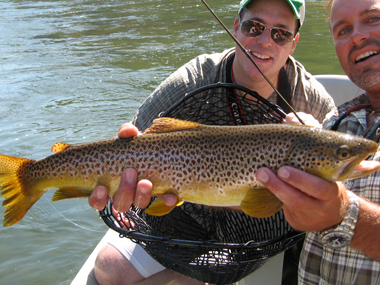 It’s common on a good day to have 30 to 40 opportunities at fish on a dry fly. The deciding factor on hooking up is execution of a proper hook-set and a little luck. But even if the success rate of catching that fish is only 50%, the guarantee for a beautiful float is 100%. Often, due to the opportunities that are given, Blackfoot River fly fishing is a great experience for the novice angler, and depending on the time of year, we may float anywhere from 10-15 miles on a given day. Get the latest tips for Blackfoot River fly fishing and much more … delivered right to your inbox!